For many of us, the winter weather recalls fond images of lounging indoors, sipping on hot cocoa and peacefully reading a book or surfing the internet. If you work outside for a living, however, you may not have quite the same fondness for that first snowfall or a window-shaking storm – although it’s quite possible that hot cocoa still factors into the equation. Your digits are the most likely part of your body to become affected by cold or frostbite. That means that a thick, durable pair of gloves is absolutely necessary for outdoor work. However, if your gloves are too thick or cumbersome, you might lose the finger dexterity that’s essential to outdoor projects, particularly when it comes to performing careful tasks and operating machinery. We suggest a happy medium in a decent pair of wool or leather fingerless gloves. They will lock in warmth while allowing your fingers to remain nimble. And we hate to say this – we really do – but to further prevent frostbite, it’s best to avoid caffeine, which constricts the blood vessels and will cause your hands and feet to become cold much more quickly. If you’re working with a chainsaw, a cut-off saw, or another product that uses an engine, then give it a minute to run before using it. That said, people often go overboard with this one. It’s a myth, for example, that car engines need to idle for minutes at a time prior to driving them; in reality, driving the car warms the engine faster than idling, and it’s perfectly safe to do so. 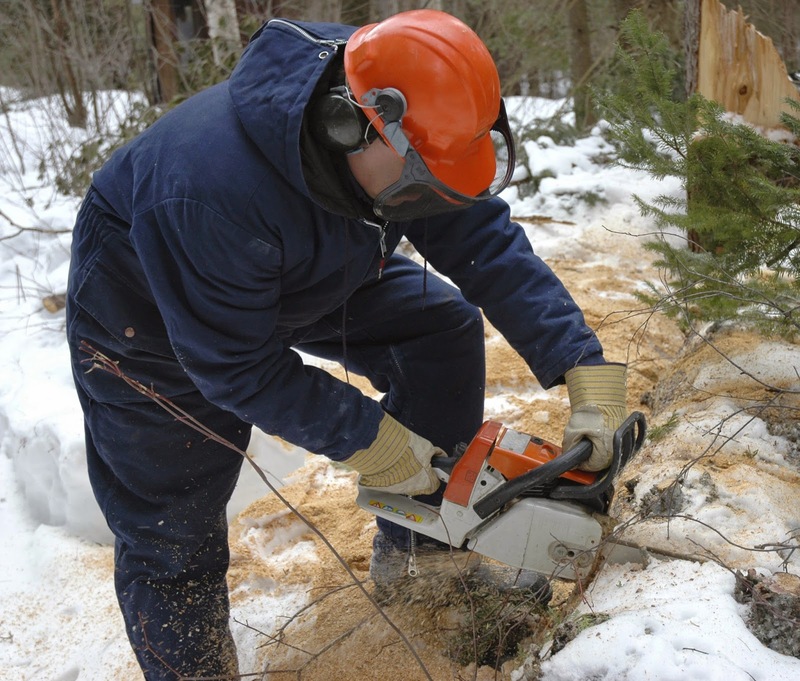 Chainsaws are a bit different and do need to idle for a few moments prior to their use, so you can check for any unusual stalling or other potentially dangerous problems. If you can, work with somebody else while you’re outside. This is a good practice for any construction project or potentially hazardous activity, but it’s especially important as the weather gets dicey. You’ll be able to monitor one another and call for help if any slips or other emergencies occur. Layering is the best friend of anyone who performs physical activities outside. It may seem like a great idea to bundle up like the Michelin man at first, but as you start working and your body starts to heat up, you’re going to want to be able to easily remove layers. We suggest: thermal shirts, insulated coveralls, removable hat or helmet liners, wrap-around eye protection, scarves, and, of course, jackets. All of these can be easily adjusted or removed as you heat up. No project is worth risking your safety. If you’re having second thoughts about the conditions outside, be it weather that’s far below freezing or a storm that poses a flood risk, reschedule the project and head inside. If you work construction for a living, it’s your employer’s responsibility to keep you safe, so never feel like your job is at risk if you point out dangerous conditions. These OSHA Winter Regulations can help you make your case. Have fun, be safe, and stock up on the hot cocoa!